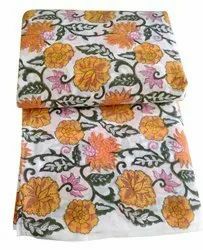 Leading Manufacturer of jaipuri hand printed block print fabric from Jaipur. Lightweight, hand block printed cotton. Easy, smock-ish cut. Mandarin collar with corded ties and self fabric triangle detail.Hand block printed in Jaipur using hand carved wooden blocks.